In June we were thrilled to find ourselves realising a long-held ambition to record two of our recent commissions, James McCarthy’s Codebreaker and Will Todd’s Ode to a Nightingale. 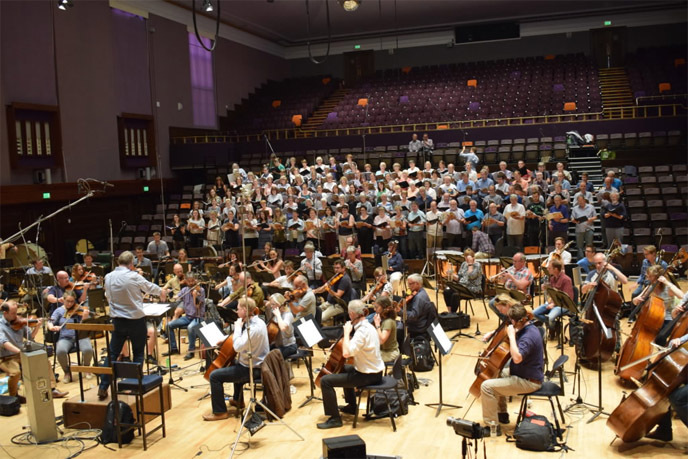 Following months of hard fundraising, the whole choir gathered at Watford Colosseum with the BBC Concert Orchestra, producer Nigel Short (founder of Tenebrae), David Temple conducting and of course James and Will. The finished version will be released in October 2017 on Signum Records and launched at a concert in St Albans Cathedral. We owe a great deal to Signum records and the BBC Concert Orchestra for supporting us in this venture.